Hi Everyone! Today i want to share with you guys the filming locations of K-Drama that i would like to visit if i go to Korea someday. I’m a fan of K-Dramas (my first K-Drama was winter sonata and i watched it when i’m in junior high school) and many K-Dramas shoots at a great place and sceneries, and i LOVE the sceneries! so i thought i will list down the locations, and here we go! 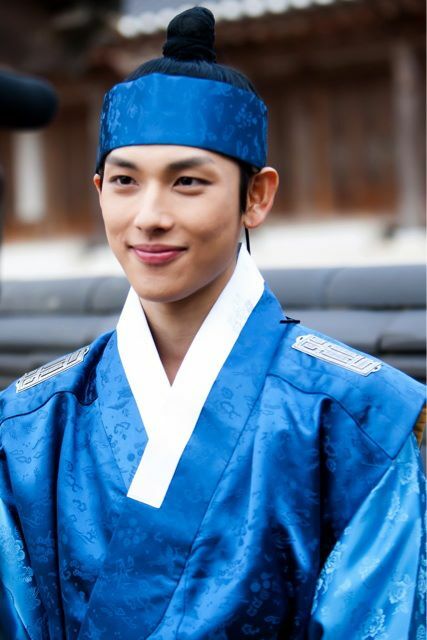 Yongin MBC Dramia is the filming set where Korean historical dramas like Jumong, Queen Seondeok, and Dong Yi were filmed. The facility features buildings from the Three Kingdoms era (the era of the Goguryeo, Baekje, and Silla Kingdoms, between the 4th and mid-7th century) to the Joseon Dynasty (1392-1910). 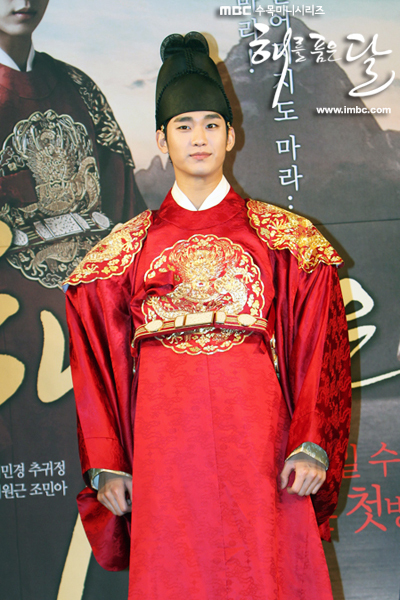 In The Moon That Embraces the Sun, royal palace scenes were mostly filmed here. The Korean Folk Village features the lifestyle and private houses of the Joseon Dynasty (1392-1910). It has on exhibit various items from the era, including household tools, farming tools, and crafts. Various events are held by season, such as farmers’ music performances, tightrope dancing, and traditional wedding reenactments. The market inside the village sells various traditional foods like injeolmi (rice cake), bindaetteok (mung bean pancake), pajeon (spring onion pancake), and Korean liquors. In The Sun and the Moon, the local markets, the private residences of the commoners, and the night scenes were filmed here. Located in 31 Beon-ji (Gahoe-dong, Bukchon), Sanggojae is a “fusion hanok,” a traditional Korean house with modern touches. 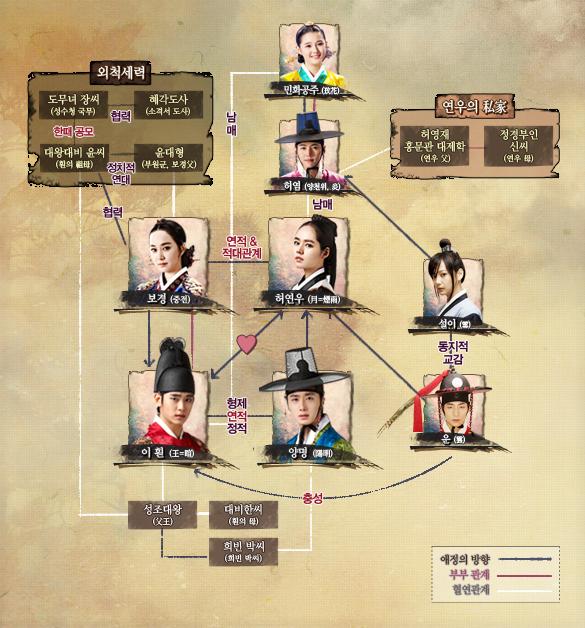 Built by Gae-in’s father, Professor Park Cheol-han (played by Gang Sin-il), the house’s name means “a place for mutual love” and reflects Professor Park’s love for his family. Scenes featuring the big mansion and beautiful garden of Hyeon Myeong-jin (Gi-jun’s aunt and chairperson of World Group) were filmed at Beartree Park in Yeongi-gun County, Chungcheongnam-do Province. Beartree Park is an arboretum with around 400,000 flowers and trees from thousands of different species. The park also has a pond with 500 carp, a ‘petting zoo’ with dozens of bears, and a deer hill where deer and elk roam—not to mention areas for peacocks and mandarin ducks. Beartree Garden is abloom with colorful flowers all year round and the tropical arboretum is abundant with plants from all over the world, making this particular filming location as unique as it is beautiful. 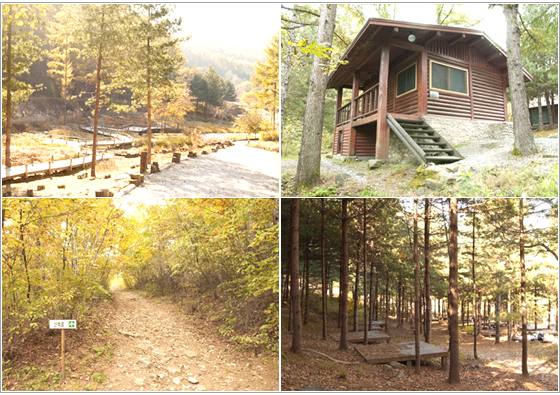 The open film set of Daeseongdoga is located inside Sanjeonghosu Lake area in Gyeonggi-do Province. Aside from a gorgeous lakeside view, the site features traditional architecture. 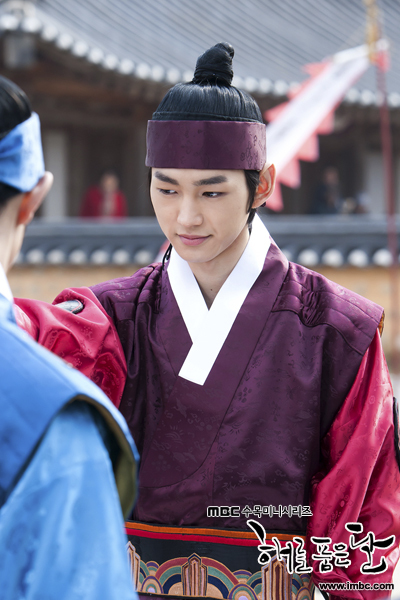 The Daeseongdoga film set sits on an area of 1,000 square meters; the entire filming location is 13,000 square meters wide. Inside the building is a makgeolli laboratory, a fermentation room, and study room. The interior of the set is filled with antique furniture and ceramics designed to match the vibe of the Daeseongdoga Brewery, a building with a long and proud history. Located in Pocheon-si in Gyeonggi-do Province, Herb Island is where Jeong-u (Taecyeon) and Eun-jo (Moon Geun-young) spend the day together. The site has a great collection of herbs and flowers in its herb garden and museum. There is also an herb restaurant, herb café, and an herb store selling various herb products. Also of interest are the aromatherapy center, the Venice Village, and petting zoo. Ragung hotel in Gyeongju was the setting for Yun Ji-hu’s traditional Hanok home. This high-class hotel consists of 16 separate houses, which are connected by corridors. The construction of the hotel required the largest number of specialized carpenters since the restoration of Gyeongbokgung Palace. Ragung was actually the name for the royal palace during the Silla dynasty. Guestrooms include private gardens and hot spring baths. The hotel is located in Korea’s very first historical theme park, the Shilla Millennium Park, and hotel rates include breakfast, dinner, and admission tickets to the theme park. The cave from which Haemosu was rescued by Jumong and was taken care of in is a famous destination for migratory birds located at Hwangmaesan Mountain. 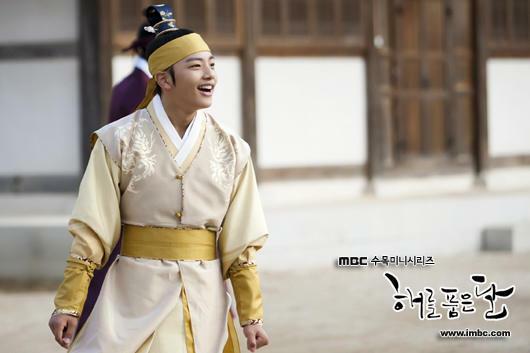 Haemosu trains Jumong in martial arts at this location, and the two characters share some good memories as teacher and student. 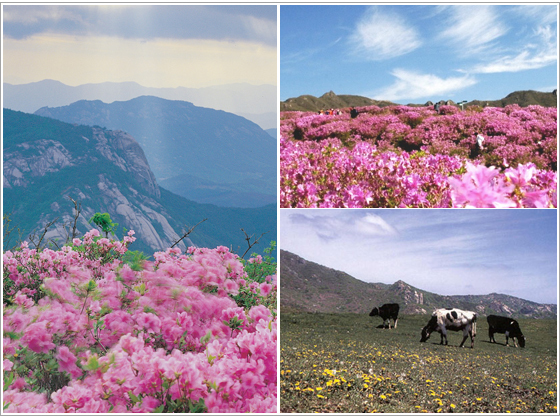 The final death scene of Haemosu was also filmed here on the wide grassy field, where it is especially beautiful on the mountaintop. 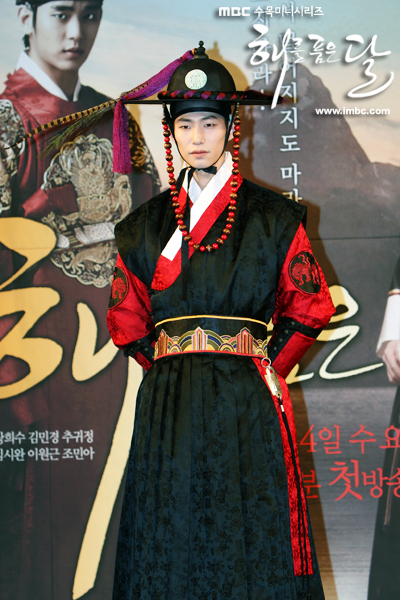 This location also served as a backdrop for the movie ‘Tae Guk Gi: Brotherhood of War’. This film location also overlooks the ocean. 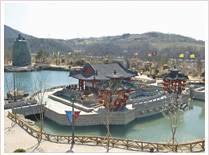 Some scenes were filmed at the foot of Hwangmaesan Mountain at the movie theme park. This park is known as the film location for the movie ‘Gingko Bed’ as well. The armies of Jumong, Byeoldongdae and Cheolgigun, fight fierce battles at the Seolmaejae Natural Park located at Yumyeongsan Mountain. This is also the film location for the scene where Jumong falls into a pit. 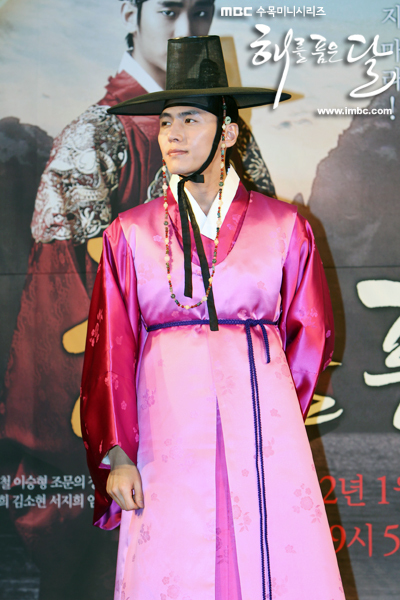 Drama ‘Damo’ and the movie ‘King and the Clown’ were both filmed here as well. 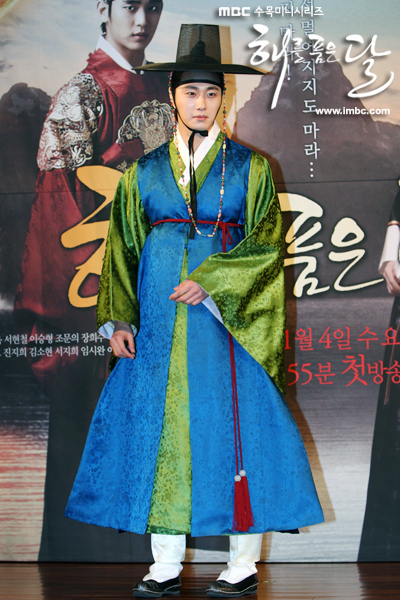 The drama ‘Haesin’ was filmed at Wan-do, and serves as the backdrop for Hyeontoseong Fortress in ‘Jumong’. 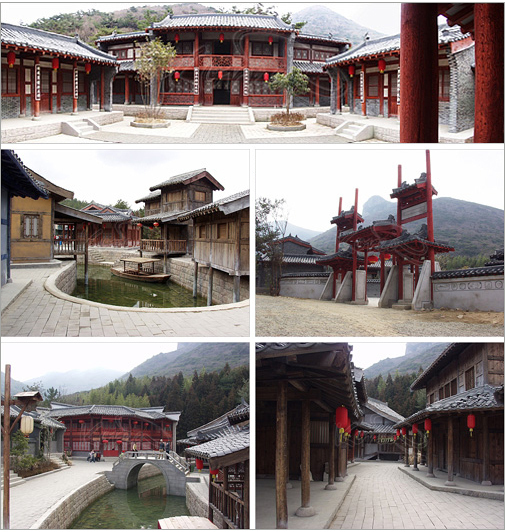 The Silla Village set was built for the KBS drama ‘Haesin’, and the set has about 40 tile-roofed houses, including private houses, Chinese-looking streets, a tavern, and waterways, recreating the China of Dang Dynasty. The Cheonghaejin Pogu (Port) Village set includes about 42 buildings, a ferry dock, vessels, a military camp, and more. Such a soothing place to have your meal, fine traditional restaurant!